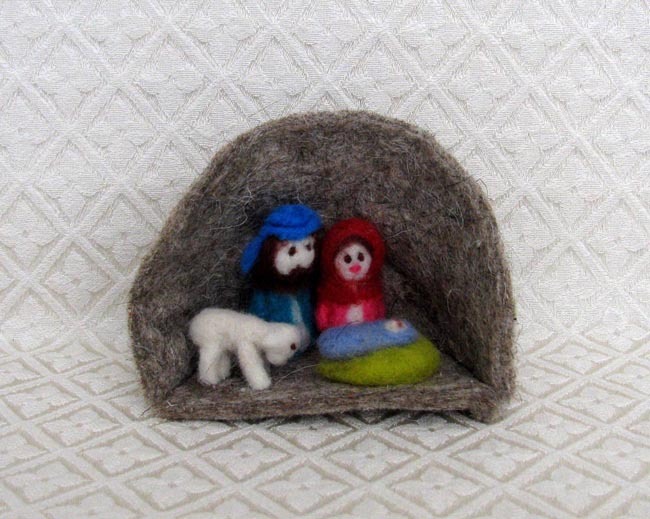 This small Nativity is handcrafted from wool felt by Sonun in a remote mountain community in Kyrgyzstan. Mary and Joseph and a lamb watch over baby Jesus. The figures are each meticulously stitched into a thick felt cave. The cave measures 3.25 inches tall by 4.25 inches wide. Sonun has been working with sewing and felting wool since her childhood, having learned the important skills from her mother and other female relatives. After developing her skills for most of her life, in 2014 she converted her hobby into a job to employ herself and other women in her community. She went to special courses to learn new technology and attended trainings on new methods of working with wool in particular. Sonun has a strong desire to help local women and their families, so she regularly shares the orders she receives with others who are also in need.